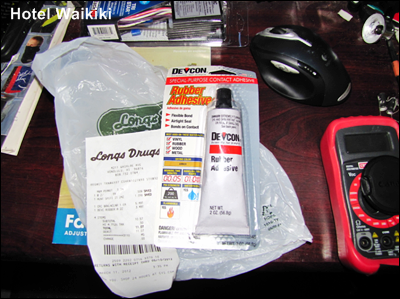 Tonight, I have two options, either remain sitted and watch the second re-run in a row of Hawaii Five-O in as many weeks, gads, or run to Long's (CVS) to return an unopened package of glue that I don't need because I have a half-used tube of glue lying around. The tube of glue cost $4 which ain't a huge amount by any standards, but nowadays I gauge the cost and urgency of any item that's borderline essential to what a gallon of gasoline cost. That is, if a given item cost around a gallon of gas, then would it be more prudent to refrain from buying the item and save the money to purchase gasoline. In this instance, it's a matter of returning an item. I use to not do this. Instead, I just stored away a redundant item I just bought from the store on the contingency that I might need it in the future. Well, the future arrived sooner than I thought that it would, but arrive it did, but solely in the sense that I accumulated so many unused items that I ran into storage issues, that is, I lost track of where I stored away a given item under a mountain of similar items that seem to all blend into each other. However, returning unneeded items to the store seldom proves cost effective, since you tend to end up purchasing random items that you absolutely have to have for some reason or the other. True, if I won the lottery tommorrow, or for that matter, the day after, all this pinching pennies would have amounted to a moot issue. But rumor has it that even winning a mega lottery works out to be a net lost too in the end. Yet in the back of our minds we prepare for the day. The day we win the lottery. How do you possibly prepare for this eventuality? Why you plan ahead where you'll gonna move to permanently with a new identity. 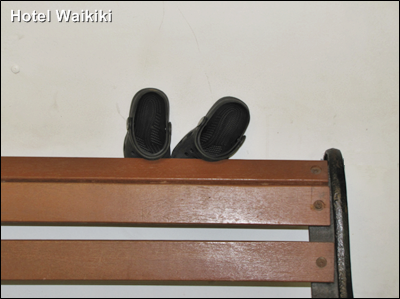 Some kid in the building forgot their shoes or slippers and a passerby stuffed it behind a bench in a hallway that residents pass on their way to the elevator. Somebody ran a website a long time ago called "Lost Soles" with lots of abandoned shoe pictures. On the one hand, when you see just one lone shoe somewhere you think there must be a story that goes with it, but on the other hand the website is just a bunch of pictures of old shoes. Maybe not a formula for success after all. we have a 'few' welfare people in our building and this isn't the first time I've seen the same size shoes lying around. I tend to pass on redundant items to my brother...especially cereal. I keep forgetting how many boxes I've bought. Kay- It's cheaper that way. I think the return policy is there to bring you back to the store and buy more things why not. I bought a bottle of shampoo that I thought was the brand my husband wanted. Expensive kine! But when I got home he said that he liked the much cheaper coconut kind that I'd bought him before. There was about a $15 difference, so I planned to take the shampoo back and get the cheap kine. But could I find my receipt that I had when I got gas at the station? Nope. Searched the kawila, searched the kitchen, searched all the grocery bags. Never did find it so I can't return the shampoo. On the other hand, last time I was at the store they put a $5.00 shaker of sea salt in my bag and charged me for it. And of course I have the receipt for that. Sheesh. How kill fight is that? Mokihana- just found your comment stashed in "comment moderation. Kill fight, and 'sea salt' (? ), always thought that was a 'my okole' label.